Jubal from Dordrecht, the Netherlands, took top honors at the 2006 Drum Corps Europe Championships on Saturday, Sept. 23. The corps, that spent three weeks this summer following Drum Corps International's Summer Music Games Tour, edged second place corps Northern Star (84.50) from Leeds, United Kingdom, by only 5 hundredths of a point. Senators (84.35) from East Leigh, United Kingdom, took third place while Beatrix -- a corps from Hilversum, the Netherlands, that participated in DCI's 2004 Summer Music Games Tour -- took fourth place in the Open Class Division. 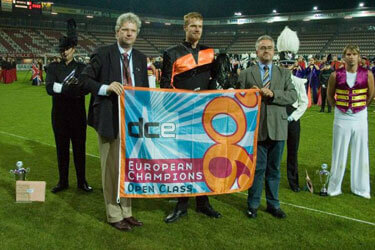 Jubal drum major Sander Schat receives the 2006 DCE Championship flag. Photo courtesy Hans Kloppert. View complete results, recaps and an event photo gallery on www.drumcorpseurope.org. Check out this video clip of Jubal's competitive program as performed this summer at the 2006 DCI World Championships in Madison, Wis.